You ever just canoe out into the middle of a lake, and then, overcome by the magnitude of the volume of water in which you precariously sit, wonder how such a majestic environment could have possibly been created? If you answered that question with a hearty "YES!" then do I have a post for you! Generally speaking, a lake is a large inland body of water that remains relatively stationary (unlike a river). Lakes come in a wide variety of shapes (e.g. , , ) and colours (e.g. , , , ). Because the world is a complicated place, there are many, many mechanisms by which a lake can form (at least 76, according to some guy named Hutchinson). Let's look at some of them. Rift valley lakes (also called rift lakes or graben lakes) form where a block of land (a rift valley), bordered by parallel cracks in the Earth's crust, sinks when the crust is pulled apart by tectonic forces. 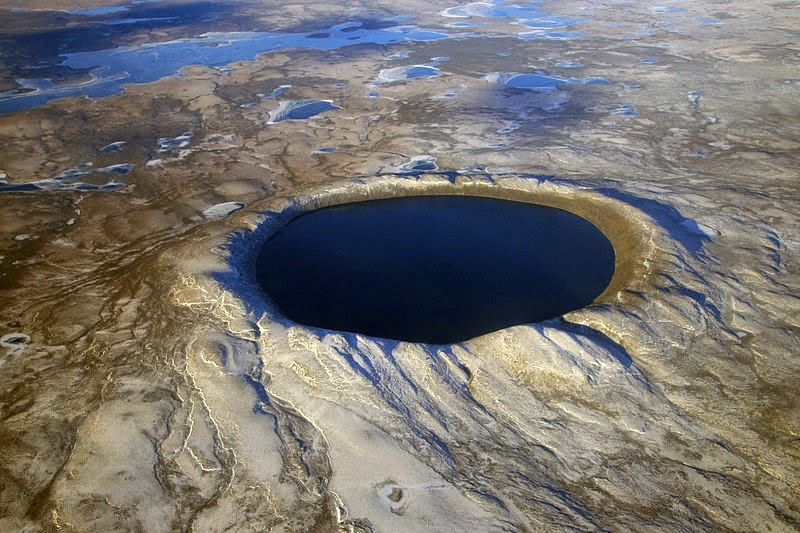 These lakes tend to be long and deep, and include many of the world's largest and oldest. e.g. Lake Baikal in Siberia. Largest lake in the world by volume. Over a mile deep. Has its very own species of seal. e.g. Lake Tanganyika in East Africa. Second largest and second deepest, next to Baikal. Longest lake in the world. Contains hundreds of indigenous species of cichlids. Site of a famous World War 1 battle. e.g. the Sea of Galilee and the Dead Sea in Western Asia, both of which lie in the Jordan Rift Valley. The former is the largest freshwater lake in Israel, while the latter is one of the world's saltiest lakes and its shore is the lowest point on dry land found on Earth (~1400 feet below sea level). Uplift lakes from as a result of the upward movement of sections of the Earth's crust (uplift). They tend to be relatively large and shallow. e.g. Lake Victoria in East Africa. Largest lake in Africa. Created by uplift of the margins of a plateau, creating a shallow depression that was filled by rivers flowing into the region. Largest lake in Africa by surface area. Deepest point is ~272 feet (compare this with nearby Lake Tanganyika, which goes down ~4820 feet at its deepest point). Has dried up completely several times since its formation. e.g. Lake Kyoga in Uganda. Created by uplift that resulted in a natural dam across a river, causing water to back up behind it. Average depth of ~19 feet. Part of the White Nile river that flows halfway across Africa from Lake Victoria to the Mediterranean Sea. e.g. Vänern in Sweden. Largest lake in the EU. Formed when a strait covering what is now the southern part of Sweden was cut off on either end as a result of uplift. 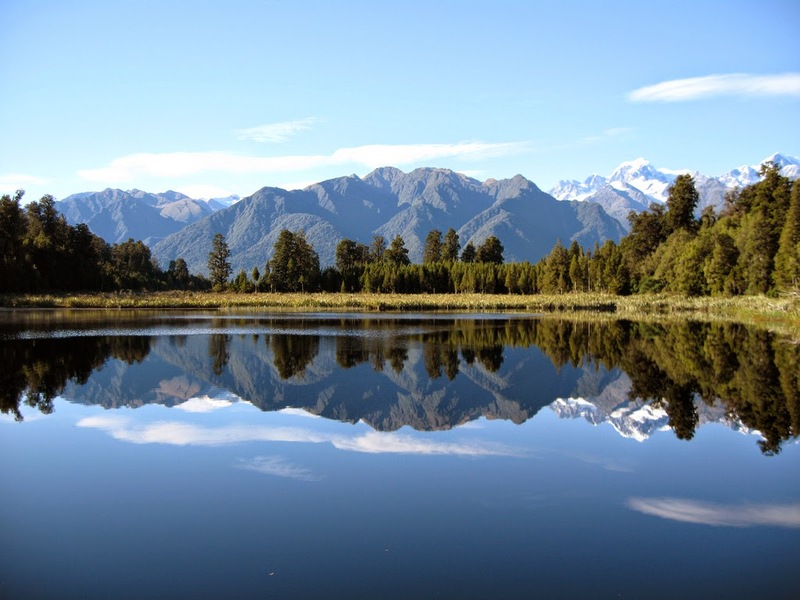 Subsidence lakes form where land sinks as the result of an earthquake or the collapse of an underground mine. e.g. Reelfoot Lake in the United States (Tennessee, near the border with Missouri). Created as a result of the New Madrid earthquakes of 1811-1812 (song), with the Mississippi River flowing backward for hours to fill the lake. e.g. a sinkhole that formed above an underground potash mine in the Russian city of Berezniki (Perm Krai). Crater lakes tend to be relatively round, as they form in volcanic craters, calderas (collapsed volcanoes), and maars (depressions created when groundwater meets lava/magma and explodes), or in craters produced by the impact of an asteroid or the underground explosion of a nuclear bomb. e.g. Crater Lake in the United States (Oregon). Lies within a caldera. Contains a large hundred-year-old vertically bobbing tree trunk affectionately called the Old Man of the Lake. e.g. Heaven Lake (Tianchi Lake) on the border between China and North Korea. Lies within a caldera atop Paektu Mountain. Home to a Loch Ness Monster-like creature (song). Birthplace of Kim Jong-il. e.g. three maars near Daun, a town in the Eifel region of Germany. Volcanic eruptions occurred in this region as recently as ten thousand years ago. e.g. Lake Bosumtwi in Ghana. Lies within a relatively young (~1 million years old) asteroid impact crater. e.g. Clearwater Lakes in Canada (Quebec). Result of a double asteroid strike. Technically a single body of water. e.g. Chagan Lake in Kazakhstan. Site of an underground Soviet nuclear test called Chagan carried out in 1965 to evaluate the peaceful use of nuclear explosions (e.g. creation of artificial lakes, harbours, and canals). Still radioactive. e.g. Taiga Lake in Russia. Site of an underground nuclear test called Taiga (synchronous detonation of three nuclear devices, intended to demonstrate their use in constructing a canal) carried out by the USSR in 1971. Volcanic dam lakes form when volcanic activity (e.g. lava flow) creates a dam across a river valley. e.g. Garibaldi Lake in Canada (British Columbia). Held in place by a lava dam called The Barrier. The region below The Barrier has been declared unsafe for human habitation due to the possibility of it failing at some point in the future and dumping out the contents of an entire freakin' lake! e.g. Lake Lanao in the Philippines (Mindanao). Contains a number of cyprinid fish not found anywhere else in the world, although these are currently being driven to extinction. Ice scour lakes form in relatively flat regions where a glacier carves out depressions in the bedrock that then fill with glacial meltwater. e.g. Great Slave Lake in Canada (Northwest Territories). Named for the First Nations people. e.g. the Laurentian Great Lakes (Superior, Michigan, Huron, Erie, and Ontario) sharing the Canada-United States border. Post-glacial rebound also played a role in their formation. Niagara Falls connects Lake Erie to Lake Ontario. Ribbon lakes are a subset of ice scour lakes formed by the preferential erosion of a band of relatively soft bedrock lying between two regions of harder bedrock as a glacier passes over them, creating a long and narrow (ribbon-like) basin. e.g. Windermere in England (Lake District). Largest lake in England. Pretty. Fjord lakes are a subset of ice scour lakes that form when glaciers carve out a long narrow valley, the outlet of which is then blocked by a terminal moraine (i.e. debris piled up by a glacier that marks its furthest advance). e.g. Okanagan Lake in Canada (British Columbia). Situated in the Okanagan Valley, a relatively warm and dry part of Canada. e.g. Lake Como in Italy. Lots of wealthy people have owned houses on its shores. Tarns (also called cirque lakes) are yet another subset of ice scour lakes that form in the upper section of valleys in mountainous regions where a cirque (a bowl-shaped depression created by erosion, usually due to the scraping action of a glacier) fills with water. e.g. Angel Lake in the United States (Nevada). e.g. Lake Ellen Wilson in the United States (Montana). e.g. Blue Lake in Australia (New South Wales). Moraine dam lakes form where glaciers deposit mounds of rock and soil (moraines), creating a basin that can then fill with water. Lots of overlap with tarns, which are often held in place by a moraine, and other ice scour lakes. e.g. Imja Lake in Nepal (near the border with China). Began forming in the 1960s at the foot of the melting Imja Glacier. Is held in place by a terminal moraine (debris piled up by a glacier that marks its furthest advance), which could be compromised in the future and result in an outburst flood. e.g. Mille Lacs Lake in the United States (Minnesota). Kettle lakes are relatively small and usually shallow, and form in depressions in the debris (rock and soil) deposited by a glacier as it advances or retreats, or in holes created by melting chunks of ice buried in the debris left behind by a glacier. e.g. Walden Pond in the eastern United States (Massachusetts). Henry David Thoreau lived on its shore. Intensely harvested for ice prior to the widespread availability of artificial refrigeration. e.g. the many lakes found in Kettle Lakes Provincial Park in Ontario, Canada. Ice basin lakes are found on or within glaciers, forming where meltwater accumulates in surface depressions or within internal cavities. e.g. the various lakes dotting the top of the Greenland ice sheet. e.g. Lake Vostok in Antarctica. Situated deep within the ice sheet. Cryogenic lakes (also called thermokarst lakes, thaw lakes or cave-in lakes) are usually shallow, cover vast swaths of coastal arctic regions, and form as a result of thawing ice-rich permafrost (specifically, the melting and collapse of elevated ice domes previously produced by frost heaving) creating depressions that fill with meltwater (a deeper layer of frozen permafrost serves as the basin floor). e.g. the oodles of lakes dotting the Taymyr Peninsula in Russia. Landslide lakes form when landslide debris creates a natural dam that blocks a river. e.g. Attabad Lake in northern Pakistan. Created in January 2010 by a landslide damming the Hunza River. e.g. Lac de Derborence in Switzerland. Created in the 18th century by successive landslides. e.g. Lake Waikaremoana in the north island of New Zealand. Formed ~2000 years ago by a large landslide. Playa lakes (also called deflation lakes) form in dry, flat regions as a result of wind-driven erosion of the outermost layer of the Earth's crust, producing large, shallow basins called playas or pans that can fill with water during rainy periods. e.g. Lake Tyrrell in Australia (Victoria). e.g. Red Lake in the United States (at the border between Arizona and New Mexico). e.g. Rosamond Lake in the United States (California). Plunge pool lakes form at the base of a waterfall where the impact of falling water carves out a basin that remains after the river dries up or changes course. e.g. Dry Falls Lake in the United States (Washington). Formed at the end of the last ice age when an ice dam holding back a giant lake of glacial meltwater gave way and the resulting flood produced a giant waterfall that carved out several connected plunge pools. Lateral lakes form alongside large rivers when sediments they carry are deposited at the mouths of smaller streams emptying into the river. This can block the smaller streams, causing water to back up and flood valleys that are situated adjacent to the river. e.g. Blue Lake, adjacent to the Coeur d'Alene River in the United States (Idaho). Floodplain lakes (also called várzea lakes) form in basins created by sediment deposition in the floodplains of a river (a low-lying area through which a river flows that floods when the river level rises), such that they remain filled and unable to drain into the river when the floodwaters recede. e.g. Camargo Lake, adjacent to the Paranapanema River in Brazil. Oxbow lakes form when a U-shaped river bend closes in upon itself (as it cuts a more direct path) and the deposition of sediment carried by the river cuts off the bend to form a C-shaped lake. e.g. a bunch of lakes (, , ) found alongside the Mississippi River in the United States. e.g. Carter Lake in the United States (Iowa). Adjacent to the Missouri River. e.g. the Oude Waal in the Netherlands near the German border. Adjacent to the Rhine River. Deltaic lakes form on deltas where rivers slow down as they enter a lake or the ocean and deposit the sediments they are carrying. Sediment deposition can create a U-shaped barrier that eventually isolates a body of water within the delta. e.g. the numerous lakes found in the Mackenzie River delta in northern Canada. 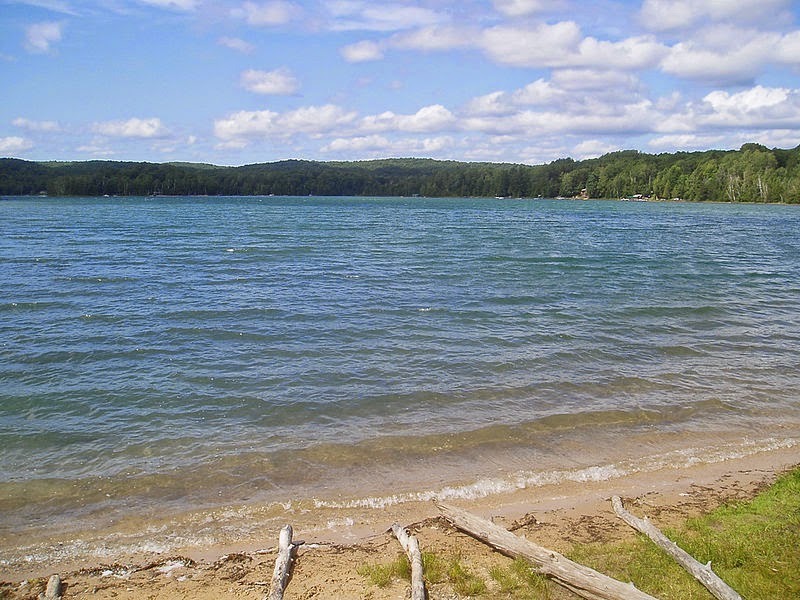 Coastal lakes form on the coasts of lakes or the ocean when a sandbar forms across a bay or shoreline indentation. e.g. Lake Nabugabo in Uganda. Adjacent to Lake Victoria. e.g. Lake Saroma in Japan. Adjacent to the Pacific Ocean. e.g. Stony Lake in the United States (Michigan). Adjacent to Lake Michigan. Solution lakes are found in karst regions, which contain lots of relatively soluble rock (e.g. limestone) that is slowly dissolved and eroded by flowing water. These processes can form circular cone-shaped basins or subterranean caves that collapse from above to form sinkholes, which then can fill with water. e.g. Ewens Ponds, three connected water-filled sinkholes in south central Australia. Popular with scuba divers because they are very clear and contain cool fish and plants. e.g. Sea Eye Lake, a sinkhole in Russia. e.g. Zacatón in northeastern Mexico. Deepest known water-filled sinkhole. Gets its name from the floating grass islands that drift about on its surface. Reservoirs are artificial lakes created by constructing a dam across a river, resulting in flooding of the land behind it. Often have a characteristic dendritic shape with many arms extending outward from a central body. e.g. Bratsk Reservoir in Russia (Irkutsk Oblast). e.g. Lake Mead in the United States (Nevada and Arizona). Created by the Hoover Dam. e.g. Lake Volta in Ghana. Largest reservoir in the world by surface area. Quarry lakes are artificial lakes that form after an open pit mine or quarry is abandoned and the remaining hole fills with groundwater and rainwater. e.g. Berkeley Pit in the United States (Montana). Created in 1982 following the closure of an open pit copper mine. Highly acidic due to acid mine drainage. e.g. Portsmouth Mine Pit Lake in the United States (Minnesota). Former open pit iron mine. e.g. the lakes found in Quarry Lakes Regional Recreation Area in California, United States. Tailings ponds are artificial lakes created to store contaminated water produced during mining processes. e.g. the ponds associated with an oil sands mining operation in Canada (Alberta). Contain what is left over after water is used to extract oil from oil sands (sand+clay+bitumen+water). Contaminated with nasty substances including metals and naphthenic acids. e.g. a pond associated with a Minntac iron ore mine in the United States (Minnesota). e.g. the ponds associated with an Alcoa alumina refinery in Australia (Western Australia). Bauxite, the major aluminium ore, includes orange-coloured iron oxides. Biogenic lakes are formed by plants or animals (other than humans). e.g. the beaver pond created by the world's longest known beaver dam, found in Canada (northern Alberta). Benzie JAH. 1989. The distribution and habitat preference of ostracods (Crustacea: Ostracoda) in a coastal sand-dune lake, Loch of Strathbeg, north-east Scotland. Freshwater Biology 22(2): 309-321. Bolch T, Buchroithner MF, Peters J. Baessler M, Bajracharya S. 2008. Identification of glacier motion and potentially dangerous glacial lakes in the Mt. Everest region/Nepal using spaceborne imagery. Natural Hazards & Earth System Sciences 8(6): 1329-1340. Branstrator DK. 2010. Origins of Types of Lake Basins. In: Lake Ecosystem Ecology. Ed. GE Likens. Elsevier. Brock TCM, Van der Velde G, Van de Steeg HM. 1987. The effects of extreme water level fluctuations on the wetland vegetation of a nyrnphaeid-dominated oxbow lake in The Netherlands. Archiv für Hydrobiologie - Beiheft 27: 57-73. Evseeva T, Belykh E, Geras'kin S, Majstrenko T. 2012. Estimation of radioactive contamination of soils from the "Balapan" and the "Experimental field" technical areas of the Semipalatinsk nuclear test site. Journal of Environmental Radioactivity 109:52-59. French RH, Miller JJ, Dettling C, Carr JR. 2006. Use of remotely sensed data to estimate the flow of water to a playa lake. Journal of Hydrology 325(1-4): 67-81. Henny CJ, Blus LJ, Hoffman DJ, Grove RA, Hatfield JS. 1991. Lead accumulation and osprey production near a mining site on the Coeur d'Alene River, Idaho. Archives of Environmental Contamination and Toxicology 21(3): 415-424. Hutchinson GE. 1957. The origin of lake basins and the morphometry and morphology of lakes. In: A Treatise on Limnology, volume 1. John Wiley. Jacobson G, Schuett AW. 1984. Groundwater seepage and the water balance of a closed, freshwater, coastal dune lake: Lake Windermere, Jervis Bay. Australian Journal of Marine and Freshwater Research 35(6): 645-654. Neal JT, Motts WS. 1967. Recent geomorphic changes in playas of western United States. Journal of Geology 75(5): 511-525. North American Lake Management Society. The Basics of Limnology. Ramzaev V, Repin V, Medvedev A, Khramtsov E, Timofeeva M, Yakovlev V. 2011. Radiological investigations at the "Taiga" nuclear explosion site: Site description and in situ measurements. Journal of Environmental Radioactivity 102(7):672-680. Schulz KL. Origin of Lakes. Stripari NL, Henry R. 2002. The invertebrate colonization during decomposition of Eichhornia azurea Kunth in a lateral lake in the mouth zone of Paranapanema River into Jurumirim Reservoir (São Paulo, Brazil). Brazilian Journal of Biology 62(2): 293-310. Tierney JE, Mayes MT, Meyer N, Johnson C, Swarzenski PW, Cohen AS, Russell JM. 2010. Late-twentieth-century warming in Lake Tanganyika unprecedented since AD 500. Nature Geoscience 3: 422-425. Wetzel RG. 2001. Limnology: Lake and River Ecosystems. 3rd edition. Gulf Professional Publishing.